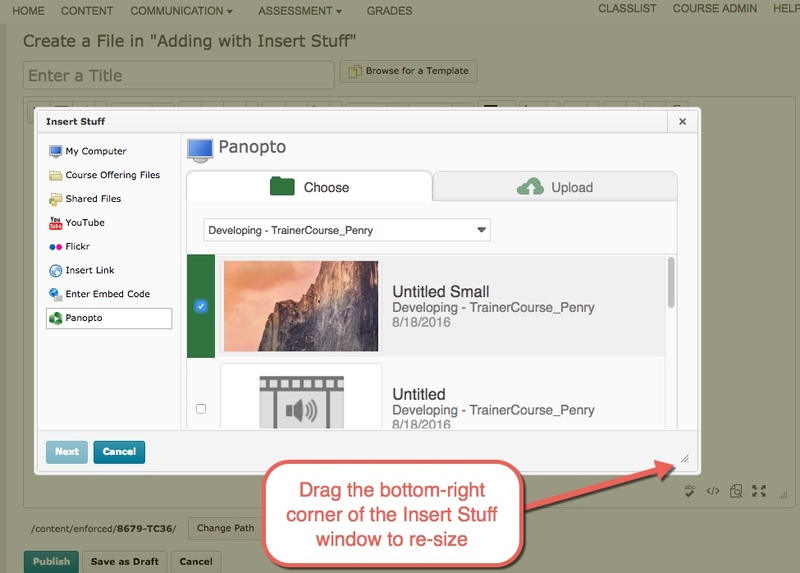 Please explore the following documentation and video tutorials to learn how to use Panopto, Wright State University's new academic media management system. After you upload your video, Panopto will go through a processing step (i.e. transcoding) to convert your video file into a format suitable for streaming online. In some rare instances, Panopto may not be able to properly process your video and you will see the message "Could not process video_file. Task failed." This can occur for different reasons, but two of the most common problems might be that the video is larger than 1080 or it does not have any audio. If your video has a larger vertical dimension than 1080 pixels, Panopto cannot process the video to be streamed online. This may occur if you use a different screen capturing tool (such as Quicktime for Mac) or if your recording device is capable of recording in 4K, which is becoming common in newer mobile devices like the iPad Pro. In those cases, we recommend you first convert your original video file down to smaller dimensions, such as 1080 or 720. Panopto recommends using a free conversion software such as HandBrake and offers some helpful documentation for converting with HandBrake. In the linked documentation, you can see there is a property for Picture SIze. You would simply need to verify that the Height property is no greater than 1080. If your video does not have any sound, Panopto cannot process the video to be streamed online. This may occur if you use a screen capturing tool and choose not to record an audio source. Even if you do not need sound for your video, you must have an audio track for Panopto to be able to process the video for streaming. Conversely, you can upload audio files that do not contain video. If the resolution on your computer monitor or device is small, you may not see the green Insert button when trying to embed a Panopto video using the Insert Stuff tool. This issue is known and is actively being addressed. If you select the video to embed and the green Insert button is missing (as seen in the image below), you can simply resize the Insert Stuff window by the dragging the bottom right corner. Expanding the window any amount will fix the error and properly display the green Insert button (as seen in the image below). The classrooms across Wright State are outfitted with document cameras. Most of the classroom document cameras are manufactured by Qomo and are not currently selectable as a video source for classroom recordings in Panopto. This is a known issue that we are currently working to resolve. In the meantime, if you need the ability to record from a document camera during your lecture, you may request to borrow an Elmo document camera from Classroom Technology Support, located at the CaTS Help Desk in 025 Library Annex. 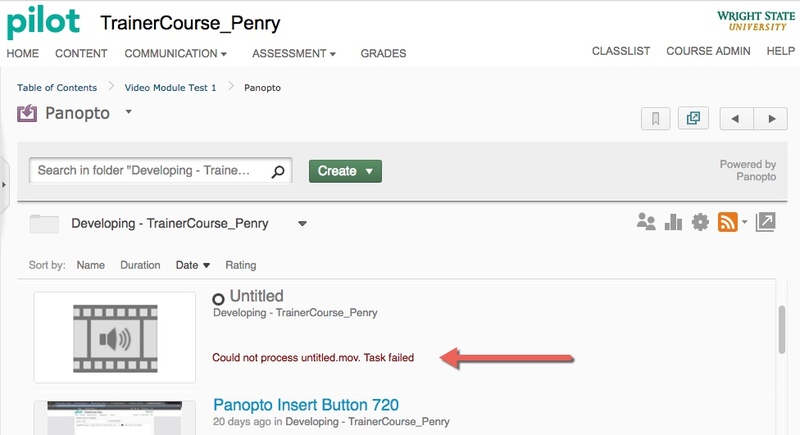 By default, Panopto only allows faculty to upload videos to their course for streaming in Pilot. If you assign video projects to students and would like them to upload to Panopto, you may create an Assignment Folder. 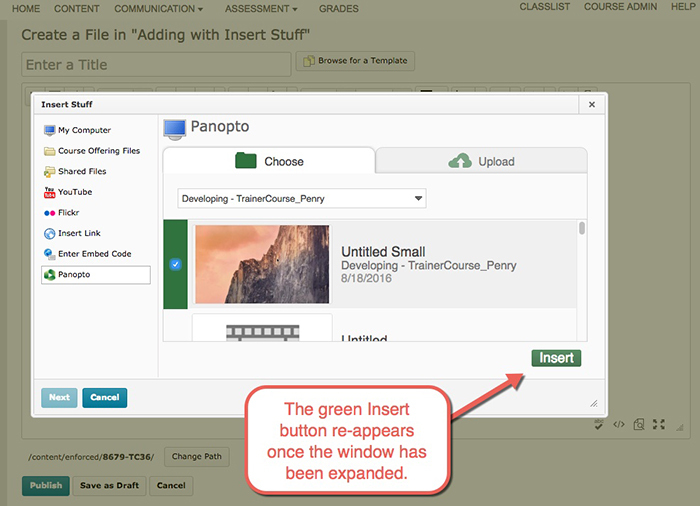 To do so, launch Panopto in Pilot and click the gear icon to display the course Folder Settings (as seen in the image below). 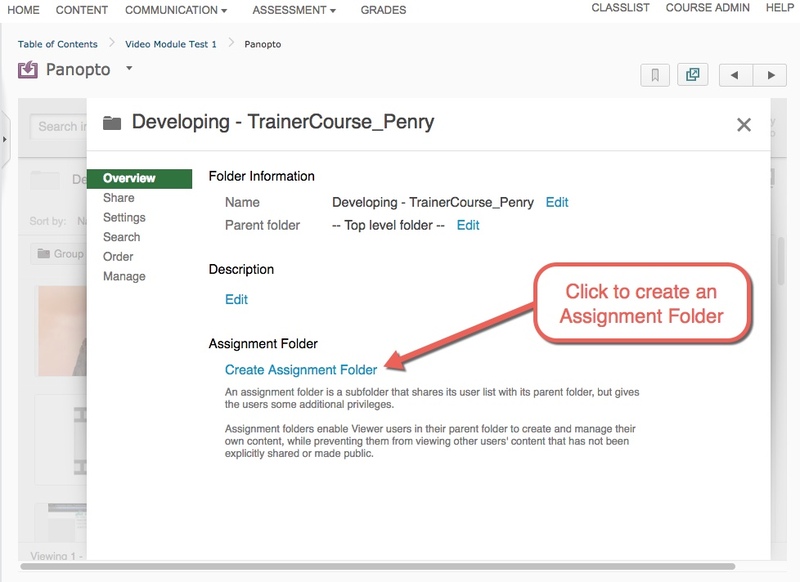 From the Folder Settings Overview, you can click the "Create Assignment Folder" link to create a folder where students can submit videos (as seen in the image below). By default, the Assignment Folder privacy settings allow the faculty member to see all submitted videos and the student can only see his or her uploaded video. For example, if your class has 20 students, the instructor will see 20 videos in the folder, but the individual student will see his or her one video submission only. These settings can be changed in the Folder Settings of the Assignment Folder if you would like for students to see video submissions from the entire class. There can only be one Assignment Folder within a Panopto folder. If you wanted mutiple Assignment Folders (e.g., Week 1 Assignment Folder, Week 2 Assignment Folder, etc. ), this can be done by creating general sub-folders (e.g., Week 1 folder, Week 2 folder, etc.) and creating an Assignment Folder within each of those general sub-folders.